Last night was not the home opener anymore. There was no pressure to perform in front of their first official regular season sell out of 15,004 at the MTS Centre. 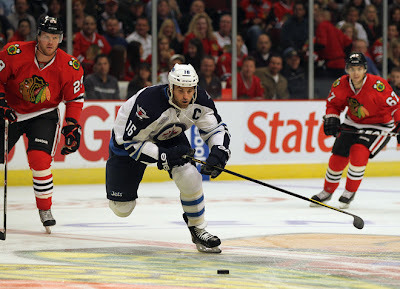 Though they were playing in front of about 6,000 more fans at the United Center in Chicago, the Jets bounced out to an early 2-0 lead only to see it evaporate in a four goal barrage by the Hawks during the end of the first and beginning of the second periods. Perhaps the Jets are in the same place this Hawks team was in 2007 and 2008 before they finally gelled and made an appearance in the Stanley Cup Playoffs. Fact of the matter is, this young Jets squad still has much to learn and needs the room to grow. And the patience to grow too. Even though the Jets had the lead after the first seven minutes of last night's 4-3 loss, they let it slip away with sloppy neutral zone play, simply letting the Hawks back in the game with some soft plays at their own blueline. Tobias Enstrom let Marian Hossa walk around him and feed Patrick Kane for the game tying goal late in the first. Early in the second, the Jets had two neutral zone turnovers in a row that led to Patrick Sharp almost cashing in twice. Suffice to say, the Jets let the Hawks win would be too harsh, but somewhat true in some ways. But before we crucify certain players or plays, let's be honest and know that this Jets team still has many lessons to learn if they are going to be successful in years to come. And this is only game 2 of 82, so let's not all rush to the panic button because that'd be unfair to do as fans and as hockey junkies. Despite letting up four straight goals, the Jets did finally sustain pressure late in the game and try to tie it late, though unsuccessful as it was. In all, the Jets played a 30 minute game - the first ten minutes of the first period and the entire third period. The rest of the game - well they let the Hawks take control of that. And when you let the Chicago Blackhakws - ala Kane, Hossa, Jonathan Toews, Sharp, Duncan Keith, Dave Bolland, and company - take over the game, you are not going to win the game, plain and simple. Still, only game 2 of 82 so let's not pick apart this Jets team because there is still a wealth of talent and potential. There's still 80 games to play and with positives such as those listed above, the Jets should come around soon.